At the tender age of 5, Sophie Cruz has been closer to the pope than most people will ever be. Cruz wove her way through security at the pope's procession through the National Mall in Washington, D.C. Wednesday, and when she reached the barricades between the crowd and the pope, he signaled to her to come to his popemobile. A bodyguard lifted Cruz up to the pope, who hugged her, and she handed the guard a T-shirt for Pope Francis with a message about immigration reform. The yellow shirt read, "Pope: rescue DAPA, so the legalization would be your blessing." Cruz, who is from South Gate, California, hopes the pope will speak about immigration reform during his congressional address Thursday. Cruz's parents are in the country illegally, and she hopes Pope Francis will help them stay in the United States. After Wednesday's events at the papal procession, Rep. Julia Brownley (D-Calif.) invited Cruz and her parents to attend Pope Francis' address in person. Gloria Saucedo, director of Hermandad Mexicana Transnacional, an advocacy group for immigration reform, told the Associated Press the L.A.-based group sent 25 people to the procession, in hopes of garnering support for the immigration movement. Saucedo also told Fox News that Sophie's actions on Wednesday "filled [the group] with enthusiasm." While Cruz's actions may seem bold, especially for a child, they're not out of line with Pope Francis' own remarks. Earlier Wednesday, Pope Francis spoke about immigration at the White House, praising America for being welcoming toward immigrants. "As the son of an immigrant family, I am happy to be a guest in this country, which was largely built by such families," he said. "I look forward to these days of encounter and dialogue, in which I hope to listen to, and share, many of the hopes and dreams of the American people." Given Pope Francis' statements, it seems likely his Thursday address will include remarks about immigration reform. In the past, the pope has said unaccompanied minors who are attempting to cross the U.S.-Mexico border should be "welcomed and protected" by Americans, so he may take a similarly liberal stance in front of Congress. And in addition to the T-shirt, Cruz also handed Pope Francis a letter, so her words might inspire him to at least mention immigration reform Thursday. 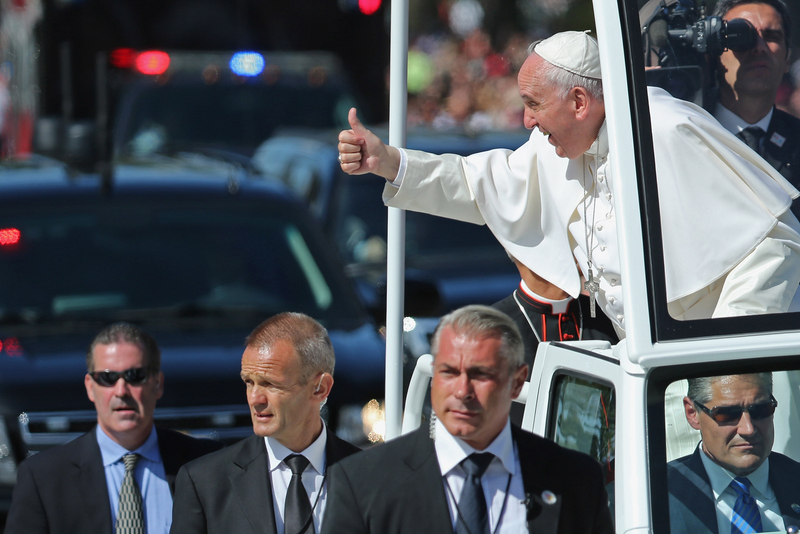 No matter what Pope Francis does say, though, the fact that he signaled to Cruz and invited her to approach the popemobile shows his openness to discussion, so let's hope he can effect real change during his visit to the United States.